Outshine everyone in this universe with this J.O.A. 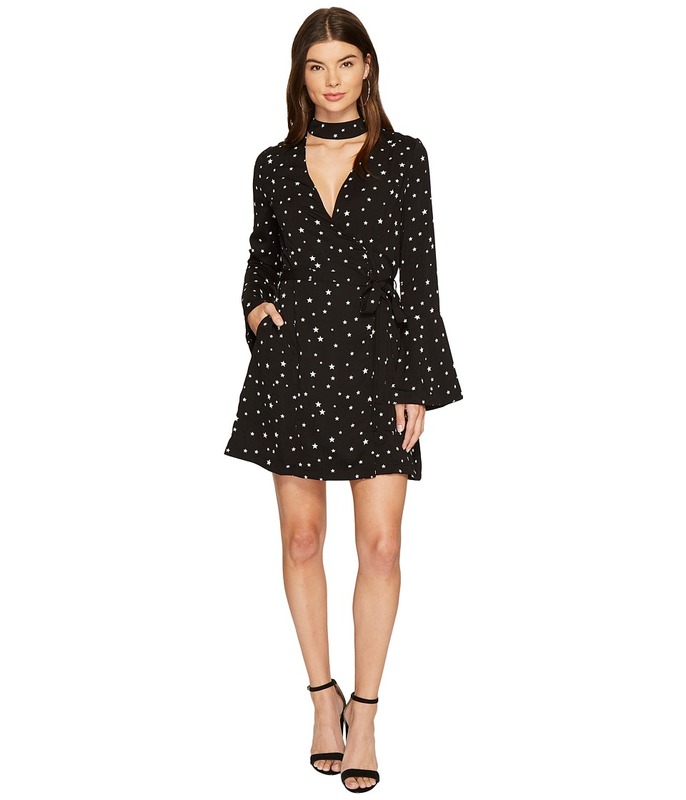 Star Choker Neck Wrap Dress. Wrap dress flaunts an attached choker for an on-trend look. Whimsical star print is featured on a lightweight fabrication. Surplice neckline. Long sleeves with bell cuffs. Self-tie waist. Front hand pockets. Straight hemline. Lined. 100 percent polyester Lining: 100 percent polyester. Hand wash and dry flat. Imported. Measurements: Length: 35 in Product measurements were taken using size SM. Please note that measurements may vary by size. Glam up your look in this J.O.A. Asymmetric Flare Skirt. 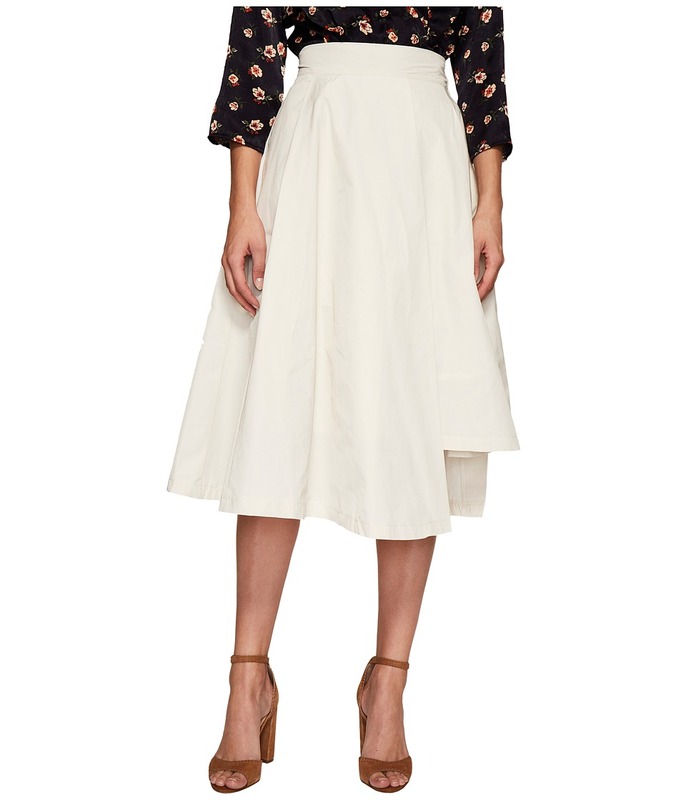 Skirt flaunts a cotton poplin fabrication on an A-line silhouette. Elastic back at waist. Asymmetric detail at hemline. Lined. 51 percent cotton, 49 percent polyester Lining: 100 percent polyester. Hand wash and dry flat. Imported. Measurements: Skirt Length: 29 in Waist Measurement: 24 in Product measurements were taken using size SM. Please note that measurements may vary by size. Update your end-of-season look with this J.O.A. sweater. 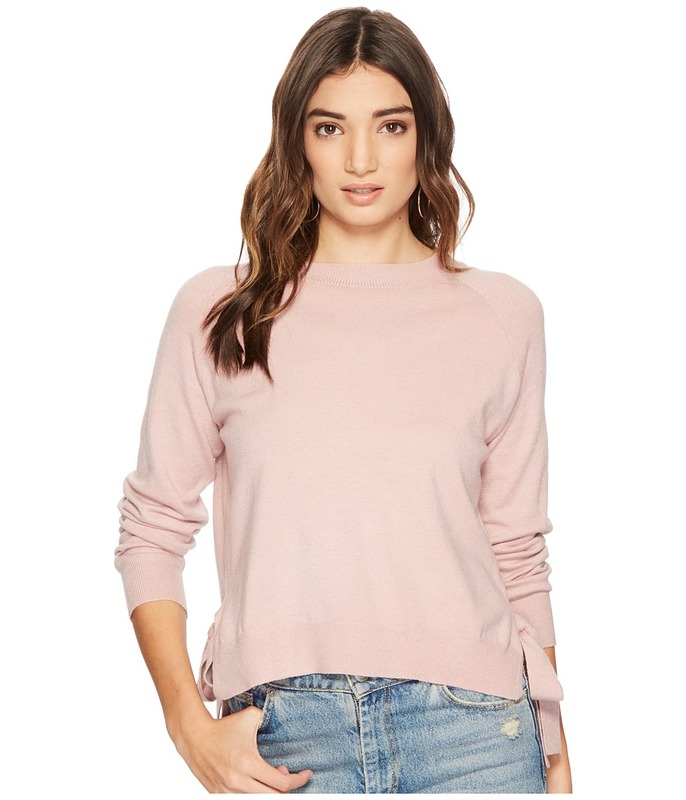 Sweater flaunts a cozy ribbed fabrication on a cropped silhouette. Bateau neckline. Long sleeves flare out at the elbows. Straight hemline with split side seams. 55 percent viscose, 27 percent polyester, 18 percent nylon. Dry clean only. Imported. Measurements: Length: 21 in Product measurements were taken using size SM. Please note that measurements may vary by size. Create a dazzling display in this J.O.A. skirt. Lightweight stretch cotton boasts a fitted silhouette. Snap-button front. Asymmetrical hemline. Lined. 97 percent cotton, 3 percent spandex Lining: 100 percent polyester. Hand wash and dry flat. Imported. Measurements: Skirt Length: 17 in Waist Measurement: 29 in Product measurements were taken using size SM. Please note that measurements may vary by size. Keep your look refreshed and refined in this J.O.A sweater. 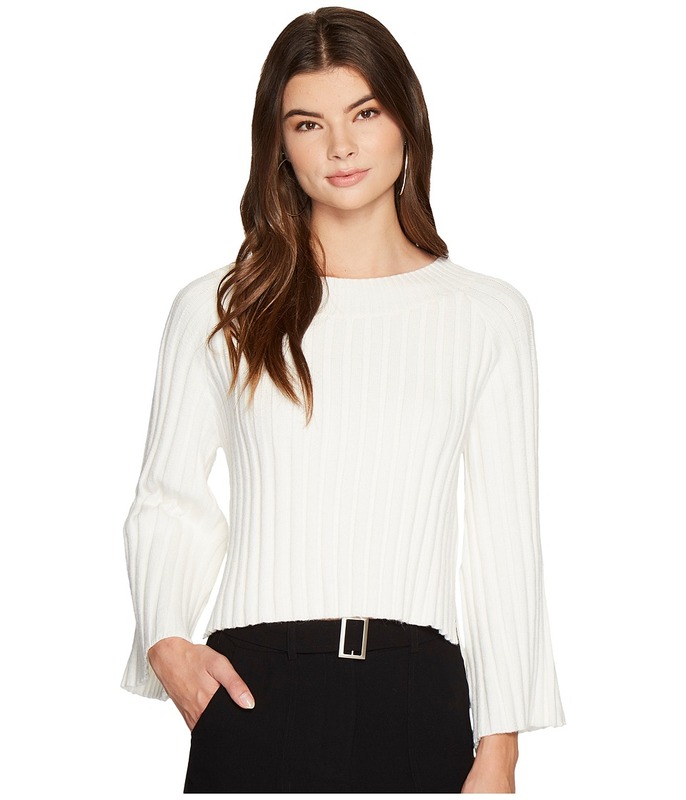 Lightweight sweater boasts a chic asymmetrical hemline for an elevated look. Cropped silhouette. Ribbed trim at the collar, cuffs, and hem. V-neckline. 100 percent acrylic. Dry clean only. Imported. Measurements: Length: 18 in Product measurements were taken using size SM. Please note that measurements may vary by size. Make sure your cozy look is as stylish as any other outfit. 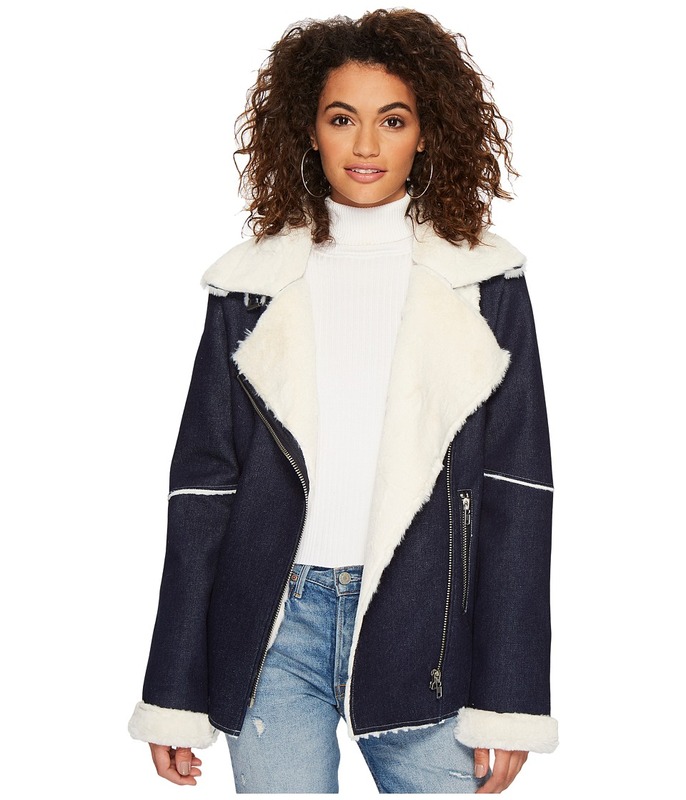 Oversized jacket boasts a denim shell and a plush faux-shearling lining Notched lapel. Off-center zip closure. Long sleeves. Adjustable buckle detail at the collar. Faux single chest pocket with zipper accent. Zippered hand pockets. Straight hemline with adjustable belt. 100 percent cotton Lining: 100 percent polyester. Dry clean only. Imported. Measurements: Length: 27 in Product measurements were taken using size SM. Please note that measurements may vary by size. Brave the cold with standout style in this J.O.A. coat. 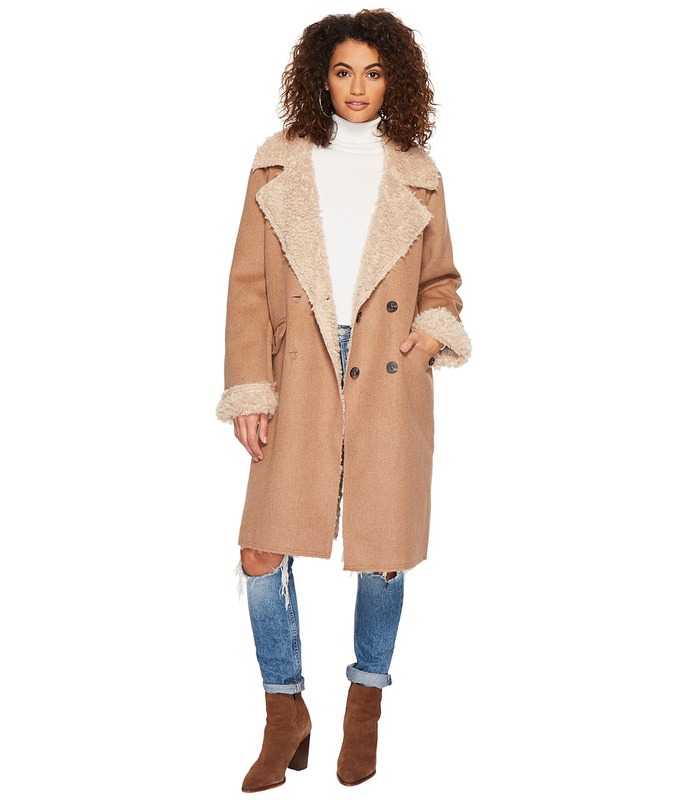 Coat flaunts a wool shell and a plush faux-shearling lining. Notched lapel. Long sleeves with rolled cuffs. Double-breasted button closure at front. Button-flap hand pockets. Fixed button tab feature at back waist brings a subtle trim to the silhouette. Straight hemline with back vent. Lined. 50 percent wool, 35 percent viscose, 15 percent polyester Lining: 100 percent polyester. Dry clean only. Imported. Measurements: Length: 42 in Product measurements were taken using size SM. Please note that measurements may vary by size. J.O.A. makes warm-weather dressing a breeze with this cozy Choker Neck Pullover. 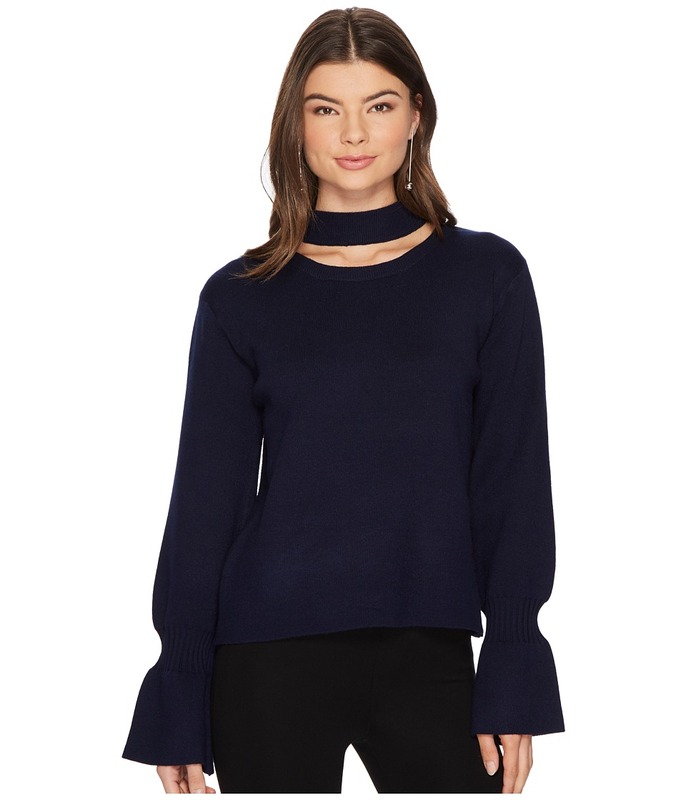 Soft tri-blend sweater shows off a flirty choker neckline. Long bell sleeves. Straight hemline. 52 percent viscose, 28 percent polyester, 20 percent polyamide. Dry clean only. Imported. Measurements: Length: 23 1 2 in Product measurements were taken using size SM. Please note that measurements may vary by size. Command the room with this J.O.A. romper. Shimmering jersey lends an eye-catching effect. Tonal stripes are featured throughout. V-neckline. Long sleeves with tie cuffs. 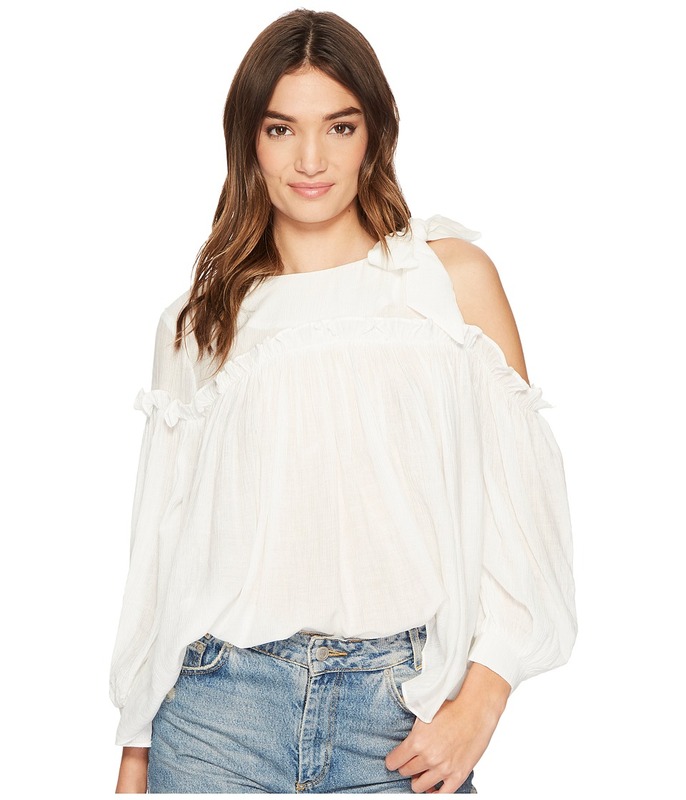 Cold-shoulder detail. Self-tie at waist. Relaxed and airy fit through the thigh. Lined. 100 percent polyester Lining: 100 percent polyester. Dry clean only. Imported. Measurements: Inseam: 3 in Product measurements were taken using size SM. Please note that measurements may vary by size. Update your sweater look with this J.O.A. top. Knit top boasts a relaxed silhouette. Ribbed trim at collar, cuffs, and hemline. Crew neckline. Long raglan sleeves. Split side seams boast a tie accent. Subtle high-low hemline. 53 percent viscose, 27 percent polyester, 20 percent polyamide. Dry clean only. Imported. Measurements: Length: 21 in Product measurements were taken using size SM. Please note that measurements may vary by size. Make sure you~re ready for festival season with this J.O.A. top. 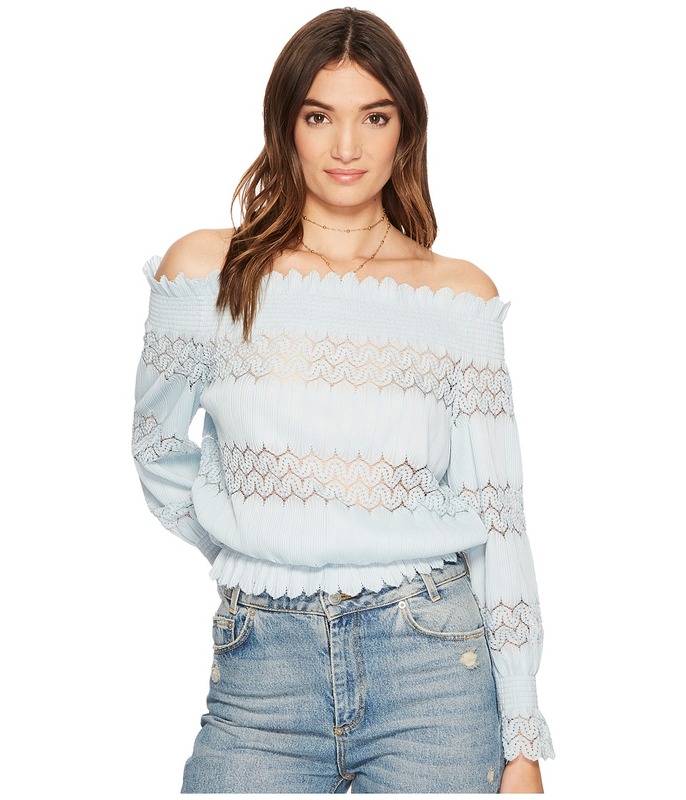 Off-the-shoulder crop top boasts sheer geometric lace insets for an elevatd look. Smocked neckline, cuffs, and hemline. Long sleeves. Straight hemline. 100 percent polyester. Dry clean only. Imported. Measurements: Length: 21 in Product measurements were taken using size SM. Please note that measurements may vary by size. Nothing says you~re ready to take on the day in standout style like this J.O.A. jacket. Lightweight linen jacket boasts a relaxed silhouette. Relaxed spread collar. Lace-up detail at back. Long sleeves. Full button-up front. Flap chest pockets. Straight hemline. 100 percent linen. Dry clean only. Imported. Measurements: Length: 22 1 2 in Product measurements were taken using size SM. Please note that measurements may vary by size. Amp up your look with this J.O.A. top. Delicate ruffles adorn the bust. Lightweight gauze fabrication. Single cold-shoulder detail with tie accent. High neckline. Long sleeves. Concealed back zip closure. Straight hemline. 70 percent viscose, 30 percent polyamide. Dry clean. Imported. Measurements: Length: 24 in Product measurements were taken using size SM. Please note that measurements may vary by size. Make sure your next stylish day out is captured on your ~gram with this J.O.A. jumpsuit. 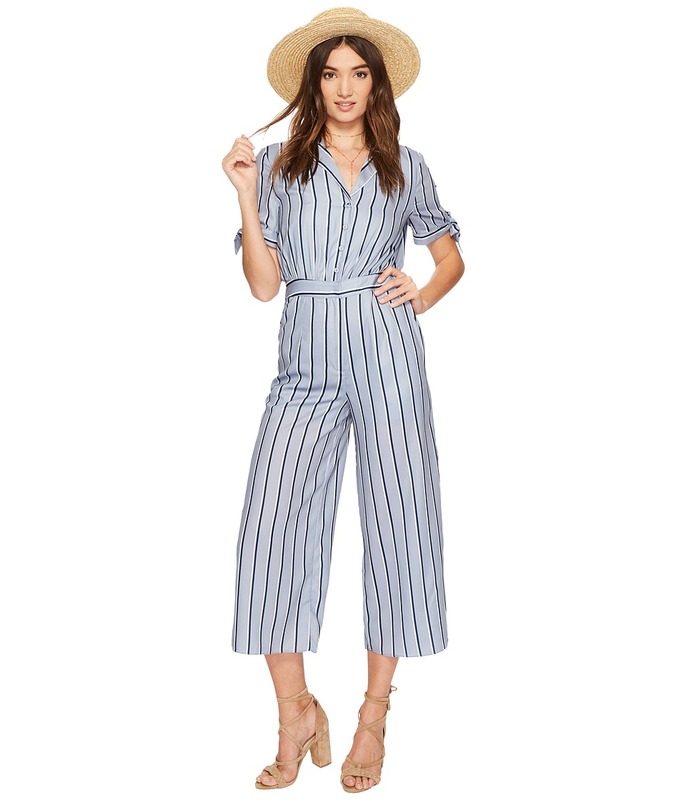 Jumpsuit boasts a classic stripe pattern on a lightweight fabrication. Spread collar. Button-up placket. Short sleeves with tie cuffs. Zipper fly and hook-and-loop closure at the waist. Front hand pockets. Relaxed straight fit through the thighs. Lined. 100 percent polyester Lining: 100 percent visocse. Dry clean only. Imported. Measurements: Inseam: 23 1 2 in Product measurements were taken using size SM. Please note that measurements may vary by size. Make sure your next stylish day out is captured on your ~gram with this J.O.A. jumpsuit. 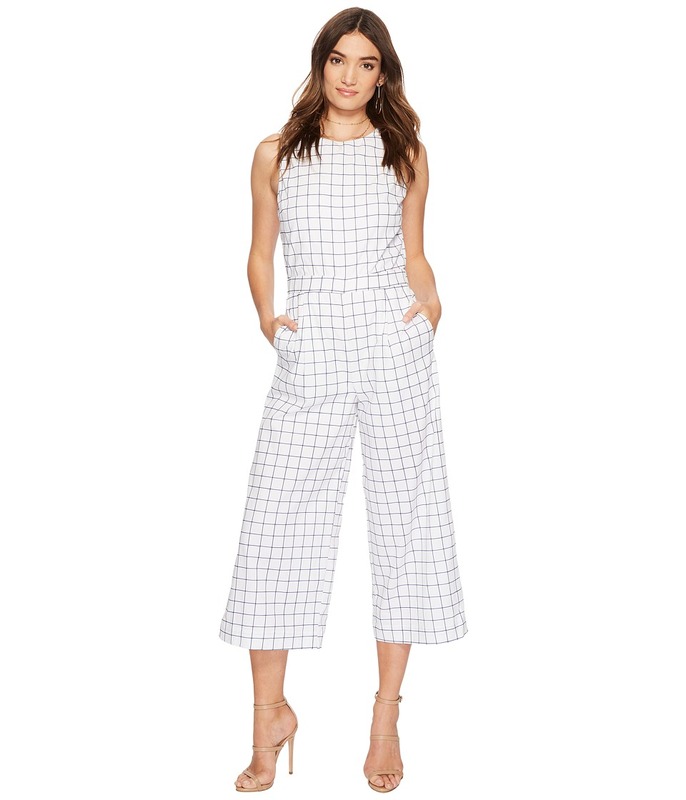 Jumpsuit boasts a classic windowpane plaid on a stretch cotton fabrication. Round neckline. Sleeveless design. Dramatic cut out at back with button closure at nape. Banded elastic waist at back with concealed zipper closure. Front hand pockets. Relaxed straight fit through the thighs. Lined. 100 percent polyester Lining: 100 percent visocse. Dry clean only. Imported. Measurements: Inseam: 23 1 2 in Product measurements were taken using size SM. Please note that measurements may vary by size. Keep your warm-weather style refreshed and refined with this J.O.A. Bubble Sleeve Top. Crisp cotton top boasts embroidered flowers throughout on a classic stripe pattern. High neckline. Long sleeves flaunt flared cuffs with a smocked binding. Keyhole with button-loop closure at back. 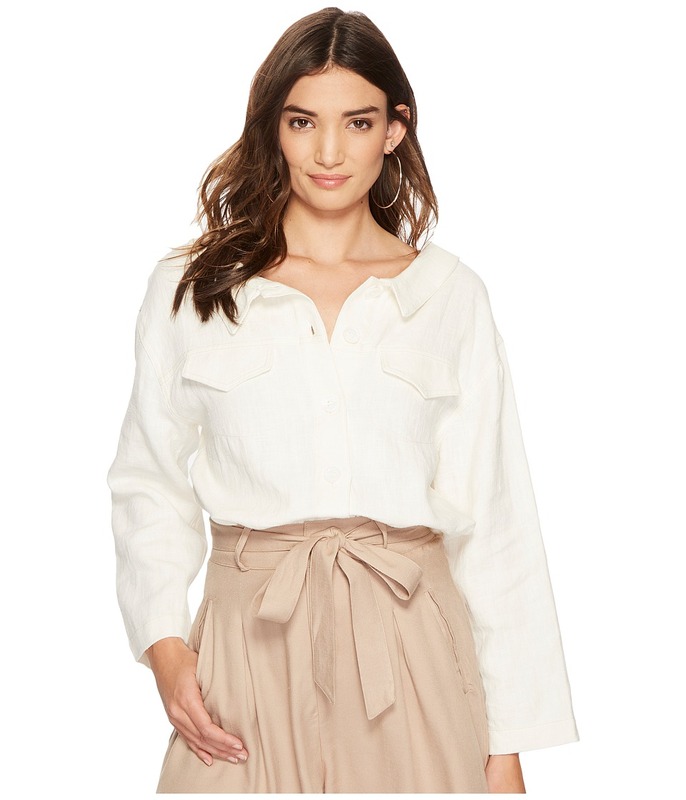 Ruffled straight hemline. Lined. 100 percent cotton Lining: 100 percent cotton Trim: 100 percent cotton. Dry clean only. Imported. Measurements: Length: 23 in Product measurements were taken using size SM. Please note that measurements may vary by size. When the weather is drab, make sure you~re still lookin~ fab! 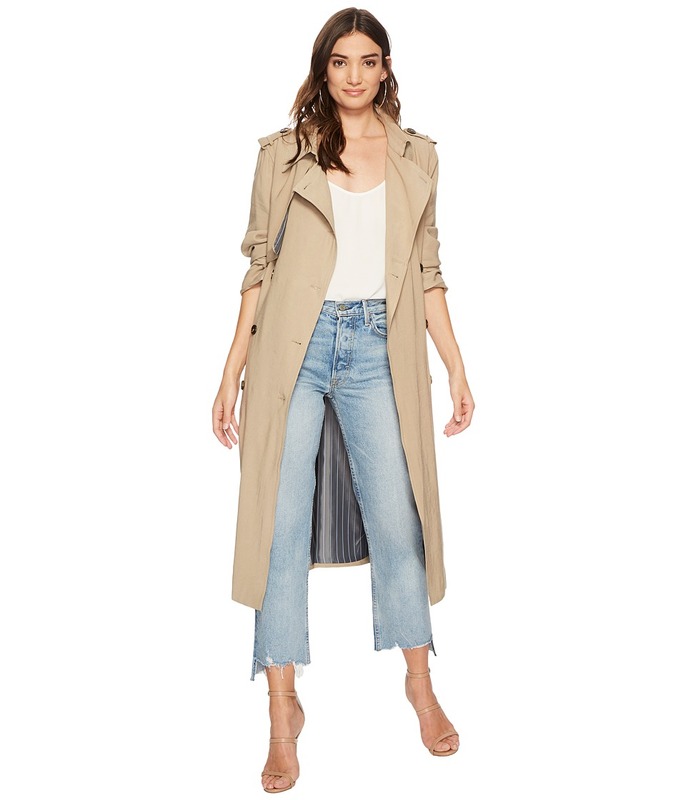 Trench coat flaunts an easy to wear fabrication. Spread collar. Double-breasted button-up front. Shoulder epaulets. Storm flap at chest and back. Long sleeves with D-ring cuffs. Belt loop waist with attached D-ring belt. Front hand pockets. Straight hemline. Lined. 92 percent polyester, 8 percent polyester Lining: 100 percent polyester. Dry clean only. Imported. Measurements: Length: 46 in Product measurements were taken using size SM. Please note that measurements may vary by size. Brunch with your bestie should only be done in standout style. 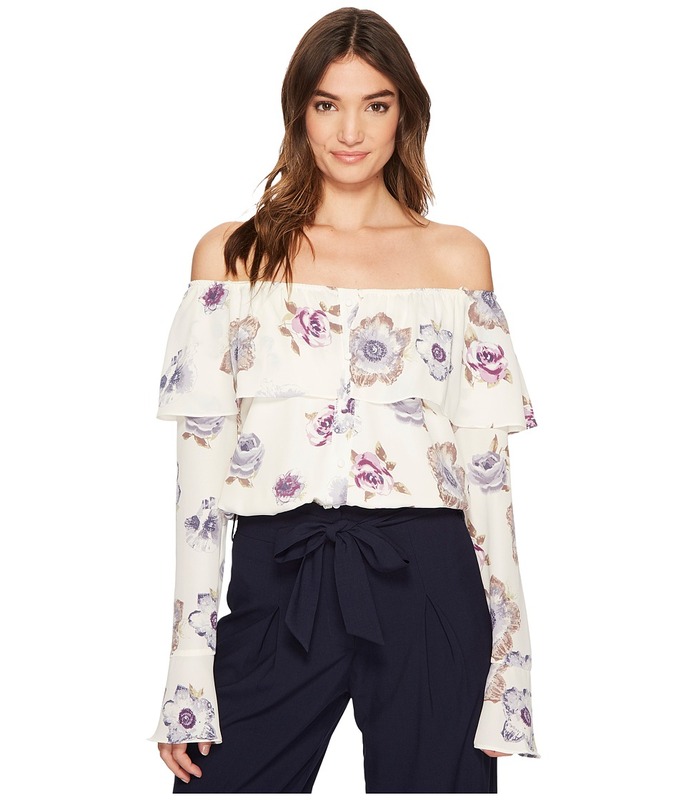 Off-the-shoulder top boasts delicate florals throughout. 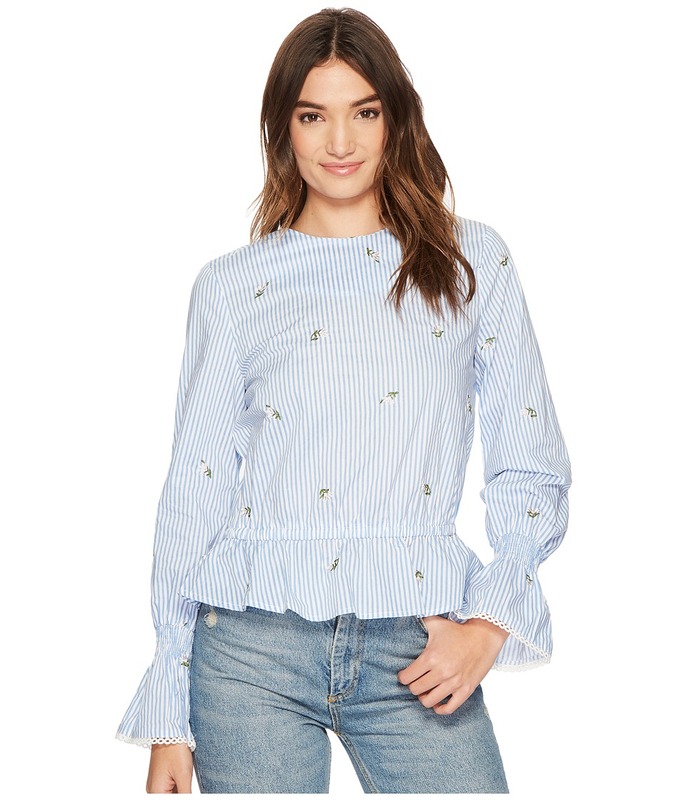 Popover ruffle trim. Elastic neckline. Long bell sleeves. Lined. 100 percent polyester Lining: 100 percent polyester. hand wash and dry flat. Imported. Measurements: Length: 14 in Product measurements were taken using size SM. Please note that measurements may vary by size.